Nissan will enter the all electric Formula E racing series in the 2018/19 season. Photo courtesy of FIA Formula E.
Volvo’s corporate communications vice president Dean Shaw knows a thing or two about what it means to be eco-friendly. At Volvo they just have that philosophy. “Every new car by 2019 [with Volvo] will have some form of electrification and we deliberately only developed three and four-cylinders, which will be augmented with electric because we saw the transition,” said Shaw. Reminder too, Volvo Cars’ engine factory in Skövde, Sweden, has become the company’s first climate-neutral manufacturing plant, having switched to renewable heating as of the beginning of the year. In fact, Skövde is the first plant in Volvo Cars’ global manufacturing network to reach this status, which marks a significant step towards the company’s vision of having climate-neutral global manufacturing operations by 2025. It is easy to see too that other car manufacturers are following the same eco-friendly trend. For example, at the Dallas Auto Show held earlier this month, Steve Parrett, Nissan’s communication guru, said that Nissan will premiere its new Formula E electric concept livery at the Geneva Motor Show on March 6. Formula E is a new FIA motor racing championship started in 2012 featuring single-seater cars powered exclusively by electricity. Nissan had already announced last October that it will enter the fast-growing Formula E series in the 2018/19 season. The all-electric series gives Nissan a highly visible global platform from which to spread the message of Nissan Intelligent Mobility – the three-pillar strategy to redefine how its vehicles are driven, powered and integrated into society. 2018 Nissan Leaf. Courtesy of Nissan. 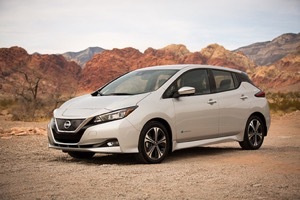 The redesigned Nissan LEAF embodies Nissan's Intelligent Mobility and features Nissan's latest technology such as ProPILOT Assist and e-Pedal. The all-new 2018 Nissan LEAF is also touted as being the best-selling electric vehicle in the world. It was completely re-invented for its second generation, combining greater range with a dynamic new design and the latest Nissan technology. Infiniti also had something to say at the recent auto show reminding attendees that new models from the brand will offer electrified powertrains from 2021. The automaker will also launch its first pure electric vehicle in the same year, predicting that electrified vehicles will comprise more than half of Infiniti global sales by 2025. Overall, Infiniti will offer a mix of pure electric vehicles and e-POWER vehicles – demonstrating the full range of low-emission vehicle technology available. Its proprietary e-POWER technology will feature a small gasoline engine that charges a high-output battery, eliminating the need for an external charging source and providing the convenience of refueling with gasoline while offering the same driving experience as a pure EV. One thing is for sure, no matter the manufacture involved, customers want a cleaner driving experience. So no matter if it’s the Dallas Auto Show or one of the others around the country, that is what manufacturers are talking about and introducing with an increase every year.